April 6, 2011 marked another high point for the University Digest (UD), the official student publication of Western Mindanao State University as the School Year 2011-2012 Editorial Board took their oath during the Induction and Turnover Ceremony at the College of Law’s Moot Court of the university. 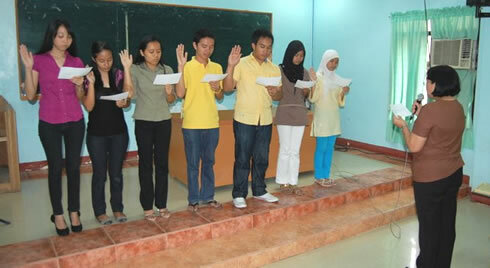 Prof. Milagros F. Yosores, Dean of Student Affairs initiated the induction of officers. Prof. Yosores expressed her expectations as the pen pushers accepted the responsibility to uphold the publication’s ideals and to dedicate tireless headship and commitment. Dr. Lea U. Laput, Public Affairs Office Director and also the University Digest Adviser for Technicalities graced the event and showed support to the young campus journalists. “Being elected as EIC pressures me a lot but I’m taking it as a challenge. This is not only my fight but our fight. I need you all to make Digest work,” Abigail Y. Fuerzas, incoming UD Editor-in-Chief directed to her fellow journalists.